It’s official, former Texas governor Rick Perry has officially entered the 2016 Presidential Race. His running mate? A custom country/rap song. Friday, Governor Abbott announced that he will appoint Chris Traylor as Executive Commissioner of the Health and Human Services Commission (HHSC) when current Commissioner Dr. Kyle Janek leaves his post on July 1, 2015. Traylor has served as the Deputy Executive Commissioner of HHSC for the last 3 years. Charles Smith, currently the Deputy for Child Support at the Texas Office of the Attorney General, will take over as Deputy Executive Commissioner of HHSC. Another retirement… Monday, Patricia Harless (R-Spring), announced that she will not be seeking reelection after serving for 5 terms in the Texas House. We’re in the money. Comptroller Glenn Hegar has certified the 2 year budget passed by the Texas Legislature, meaning there is enough money in the state’s coffers to cover it. It now heads to the Governor’s desk for his signature. Looking for a way to cool off now that Summer is here? Barton Springs is the place for you. The Springs were closed temporarily due to damage from the recent floods, but have reopened this week. 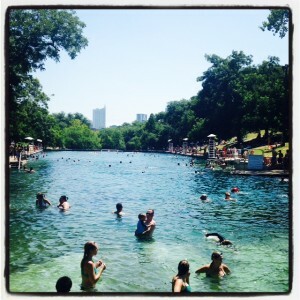 Barton Springs is open from 5am to 10pm daily.